A breakthrough hair renewal therapy oil that reverses the thinning hair and balding scalp and makes normal hair much thicker and stronger with other added benefits. 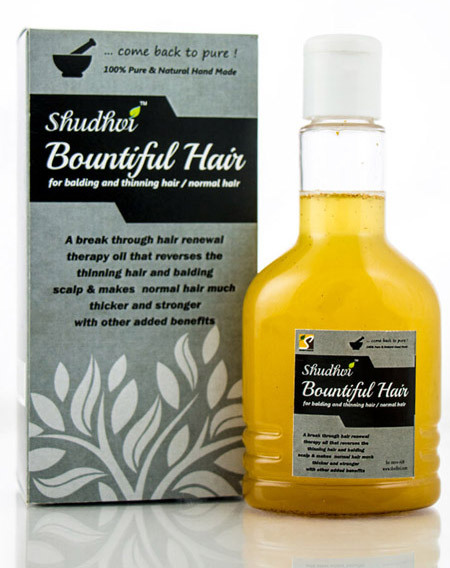 A special hair therapy made of pure and natural special Ayurvedic extracts exclusively only to shudhvi. Completely treats dandruff, hair-fall, itchy scalp and other infections, prevents greying of hair and leaves the hair dark, soft and shiny. It can also be used for skin infections like psoriasis etc. and also as anti aging. To be used twice a week. Pure and Natural Ayurvedic extracts.